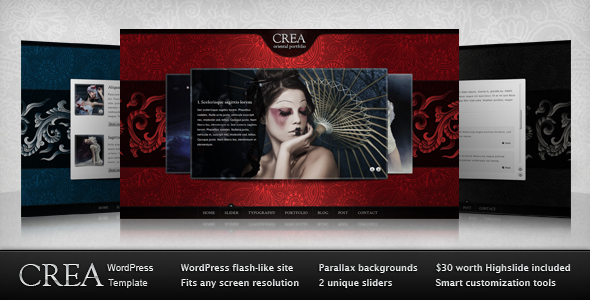 CREA is a theme which claims to be "flash-like." I don't know if that's a good thing or a bad. Whenever someone mentions Adobe Flash, I go into an apoplectic fit, no doubt caused by my love of Adobe Flash, which is the illegitimate step-child of World Wide Web technology. But, I digress. This theme fits any screen resolution (amazing), has parallax backgrounds, 2 unique sliders, Highslide includes, and "smart" customization tools.